Cook onion and celery in 4 tablespoons butter over moderately low heat, until tender and transfer to a bowl. Stir in crab and bread crumbs. In a small bowl whisk together mayonnaise, seafood seasoning, Worcestershire sauce, hot sauce, parsley, and salt and pepper to taste and stir into crab mixture until combined well. Line a baking sheet with wax paper. Form crab mixture into 6 flattened rounds. Chill crab cakes, covered with plastic wrap, at least 1 hour. 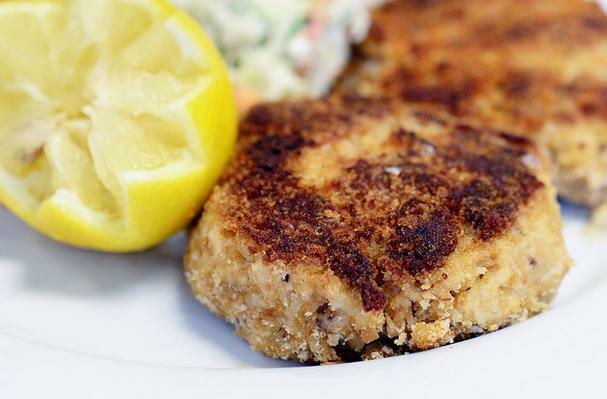 Heat 1 tablespoon butter over moderate heat until foam subsides and cook half of crab cakes until golden brown, about 2 to 3 minutes on each side. Cook remaining cakes in remaining tablespoon butter in same manner.